Michelle McGrattan's Delicious & Nutritious Recipes and More! 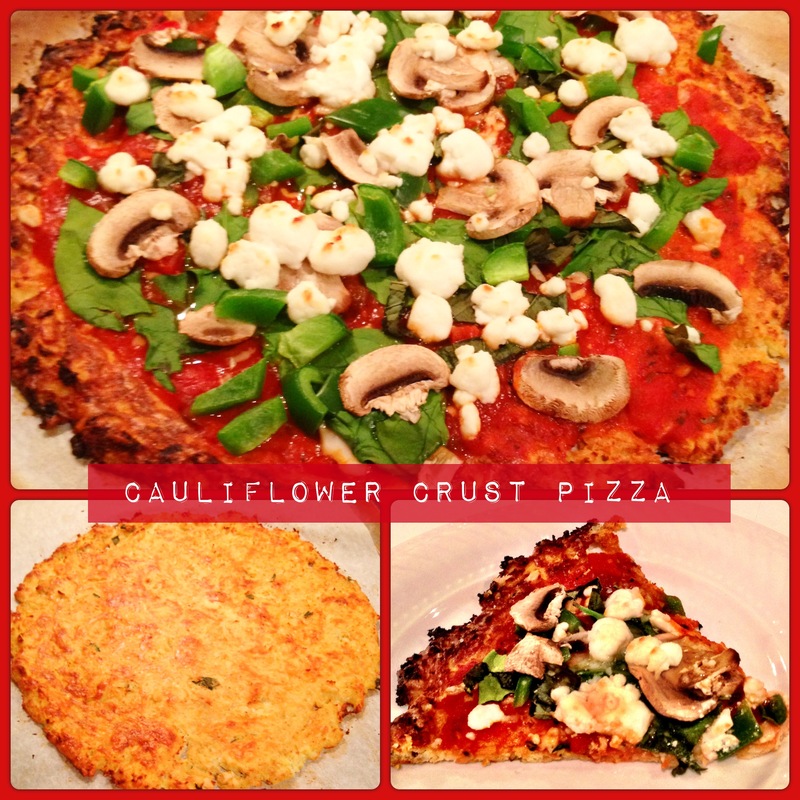 Pizza Crust made from cauliflower? Sounds like a strange combo but I assure you that this recipe is delicious, easy and gluten and grain free ;). I have been meaning to attempt this recipe for quite a while now and am glad that I finally did. 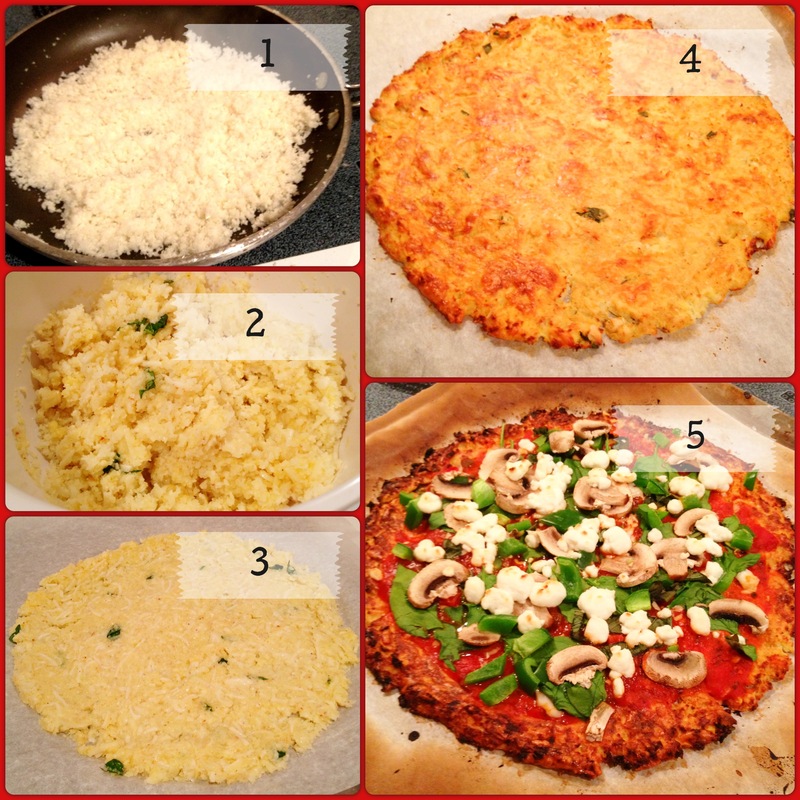 I made this for myself one night and had to make my husband Brian another meal for dinner since he wasn’t too excited about eating cauliflower crust lol. Needless to say I only got one piece out of it. He demolished it. I rest my case. You can top the pizza with any ingredients of your choice. I went with goat cheese and variety of veggies. I hope that you enjoy this as much as we did! Saute the cauliflower for a couple of minutes on a medium heat until translucent (optional). Cover a baking sheet or pizza stone with parchment paper or spray the sheet with coconut oil. In a medium bowl, combine cauliflower, egg, mozzarella and spices. Press evenly into the shape of a pizza crust (make sure it is not too thick) on the baking sheet or pizza stone if you have one available. Bake the crust for 12-15 minutes. You may turn over once if desired. Remove the crust from the oven and add pizza or pasta sauce and any toppings such as veggies, lean meat and cheese . I used pasta sauce, mushrooms, peppers, basil, spinach, cherry tomatoes and goat cheese. Place under the broiler, on high heat, until cheese is melted about 5 minutes or so. Just keep an eye on it. Superfoods & Breakfast of Champs!